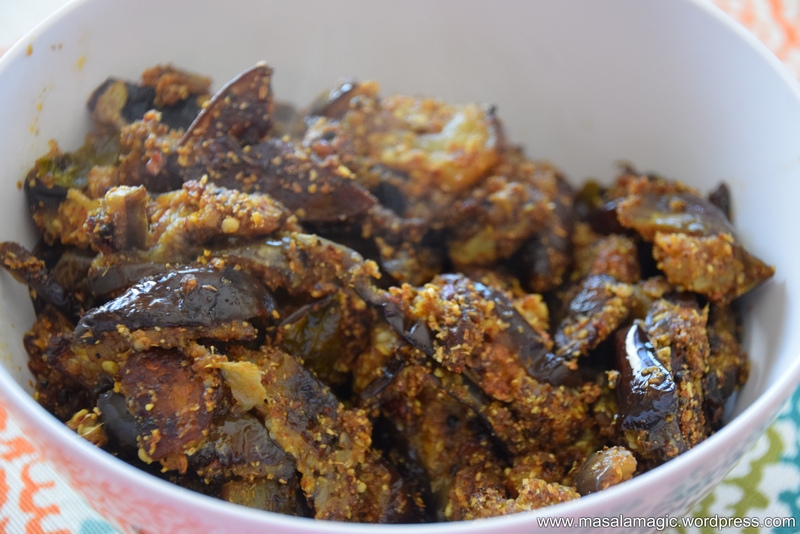 This Eggplant Dry Curry is a Tamilian style dish called “Kathrikaa Podi Karamidu”. 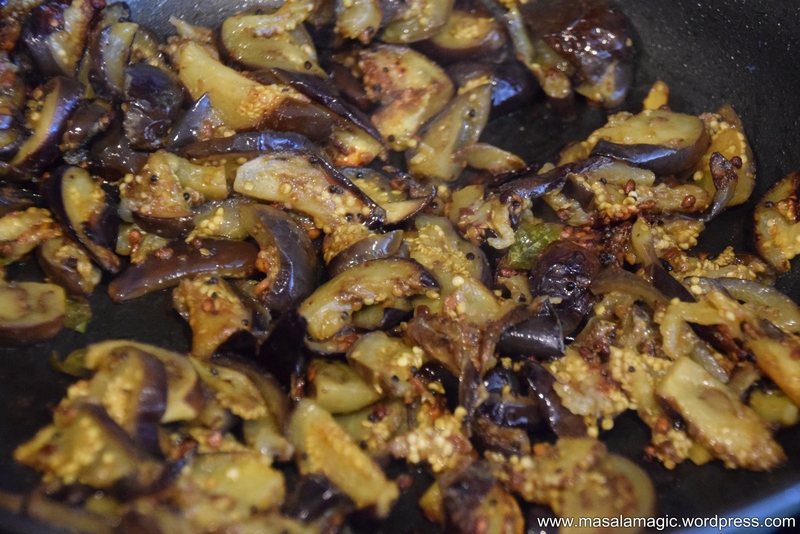 This typical tambrahm style dish is one of my favorite ways to eat eggplant or brinjal, especially when the tiny eggplant slices are roasted to perfection. 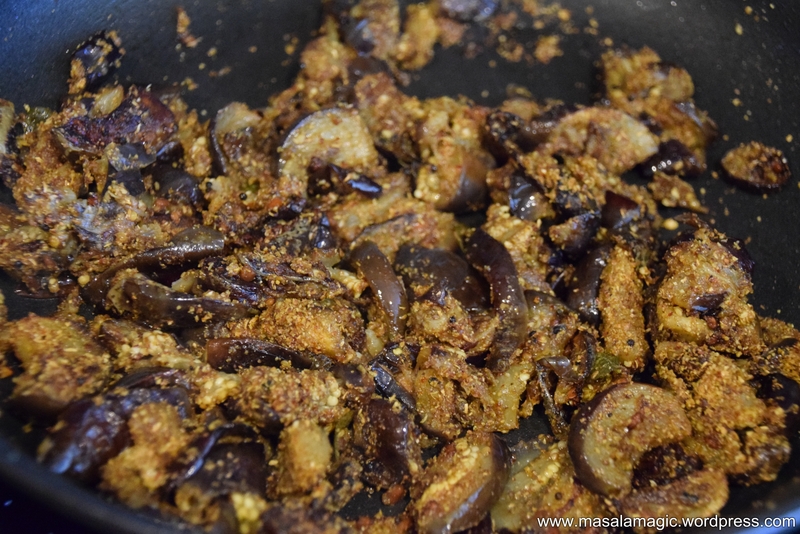 Tastes great as a side to Hot Rice and Sambar or even with just plain curds. I learnt how to make this recipe from mom and this is a sure winner!! 1. Take all above ingredients except the coconut in a pan. 2. 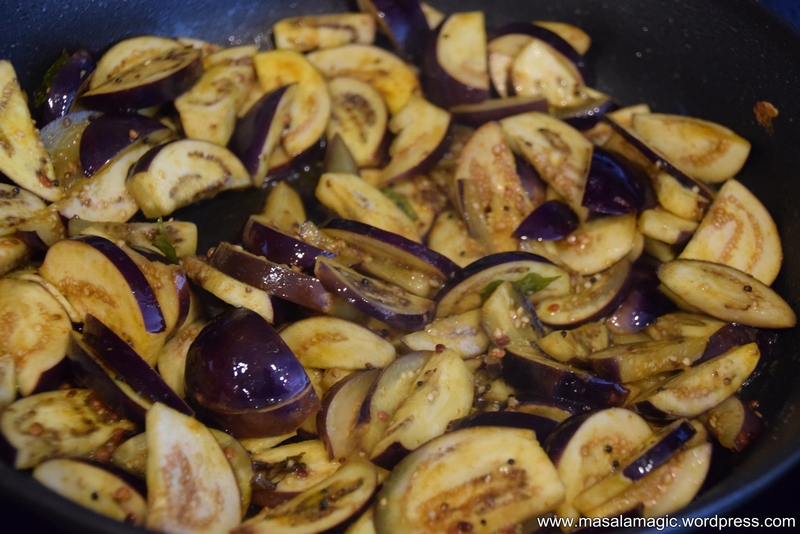 Add 1 tsp Oil and roast on Low to medium flame until the dals are golden brown by stirring continuously. Do not leave unattended as they burn fast. Burnt dal will make the powder taste bitter. 3. Once well roasted, turn off the stove. 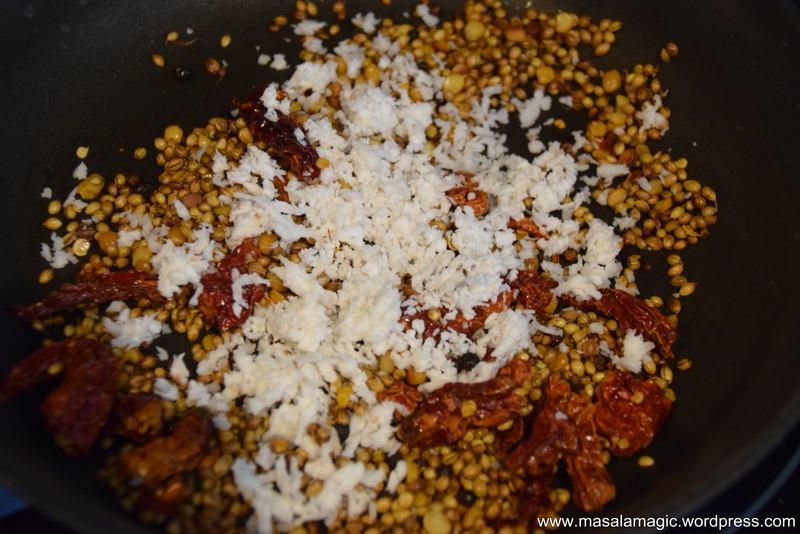 Add the grated coconut and mix. Keep aside to cool. 4. 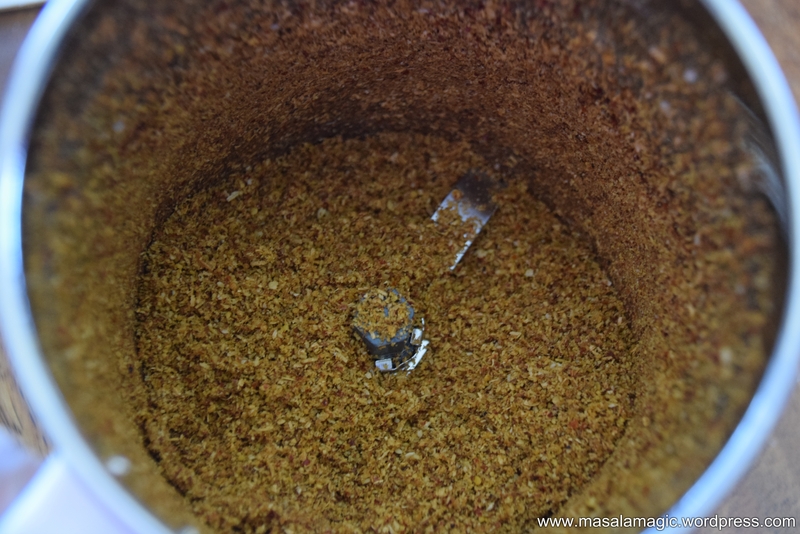 Dry grind in a mixer or a food processor into a coarse powder. 1. Wash the eggplant. 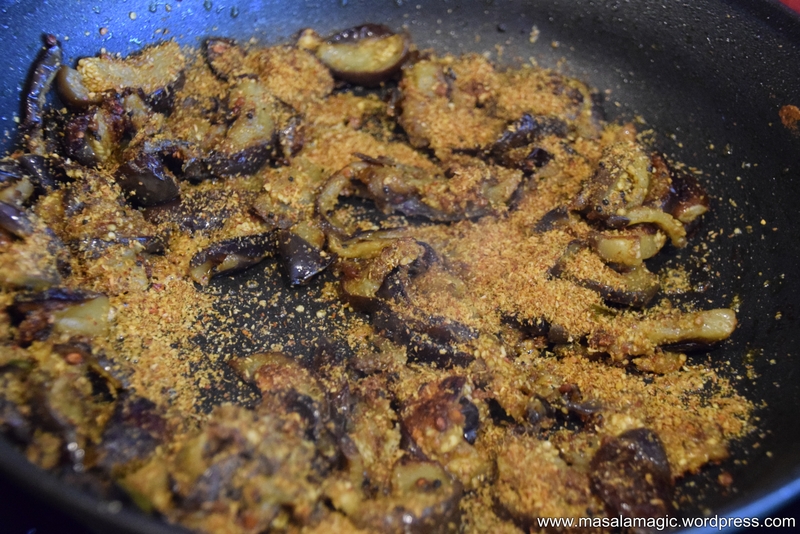 Chop off the crowns and slice the eggplant into medium thin slices. 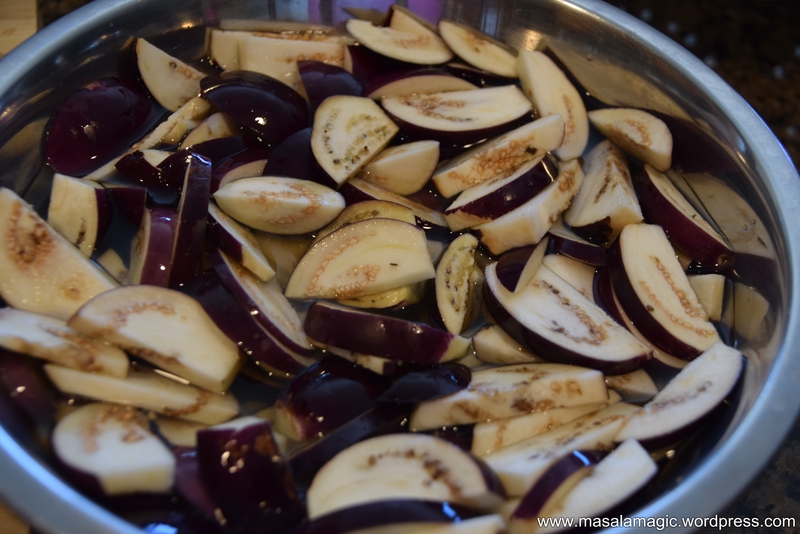 As you chop the eggplant transfer to a bowl of water, otherwise the slices will get brown. 2. 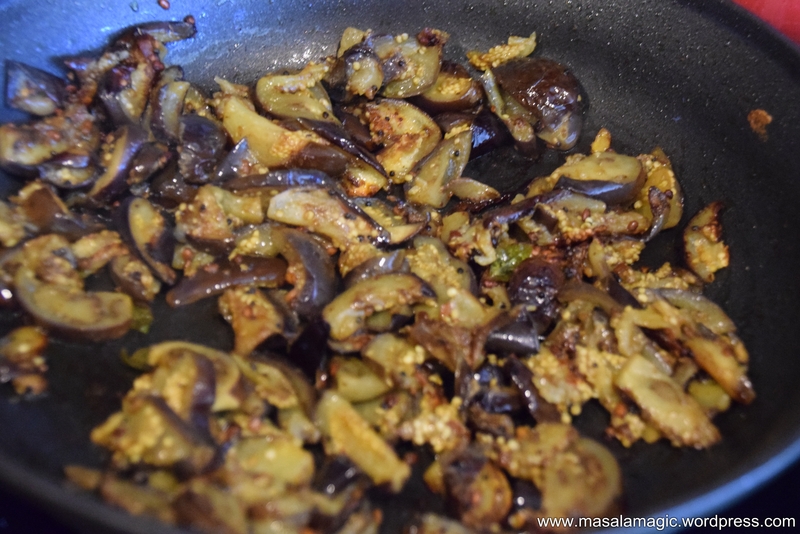 Drain the chopped eggplant in a colander and keep it ready. Ensure that you drain all the water. In a pan heat the oil. 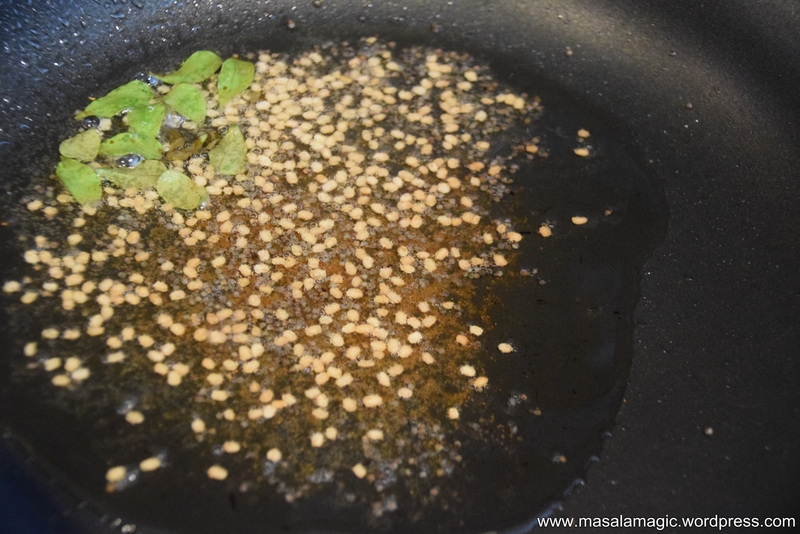 Add hing and mustard seeds, when the mustard splutters, add the urad dal and allow to turn golden brown. Then add the curry leaves. 3. Add the chopped eggplant. 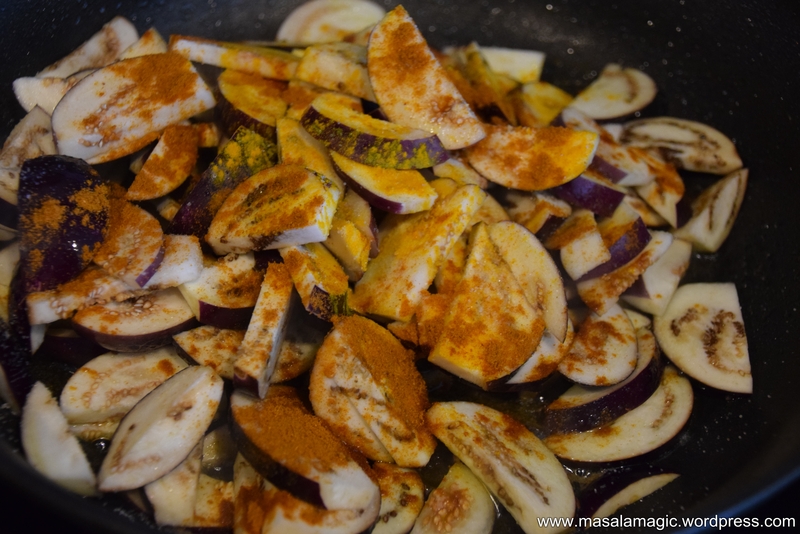 Add turmeric powder and Sambar powder and mix well. 4. Add salt as needed and mix well. Ensure that the stove is on medium flame. 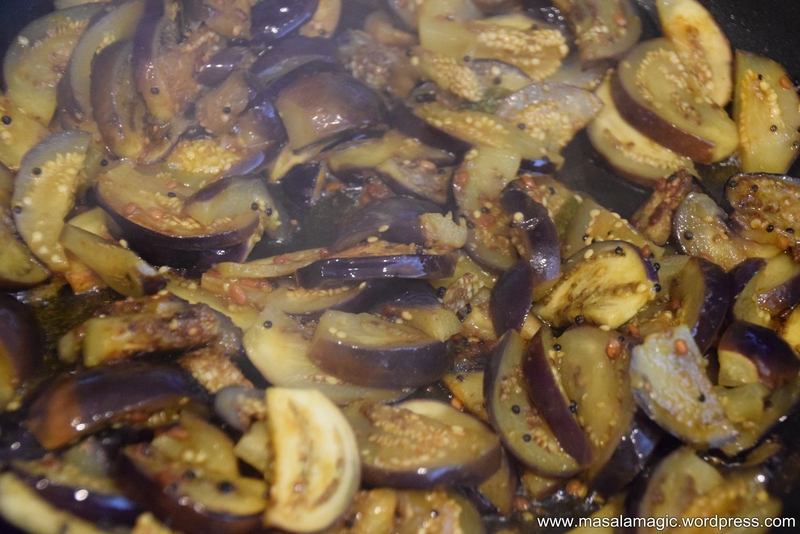 You have to roast the eggplant slowly and gently. When mixing mix gently to ensure the slices do not break. Drizzle a few drops of oil on the sides if needed while roasting. There is no need to cover with a lid. The slices will cook as they roast slowly. 5. Once the slices are well roasted (will take about 10 to 15 minutes). Add 2 to 3 tbsp of the dry powder. Mix well. 6. 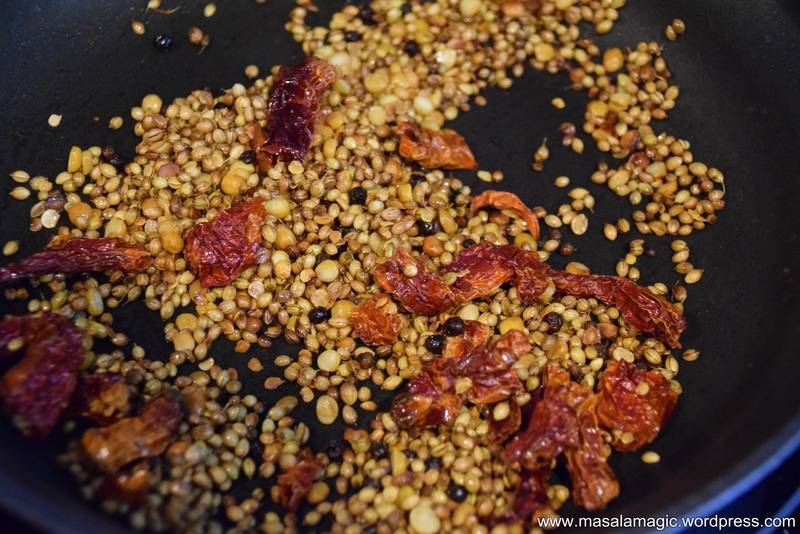 Serve hot as a side to Rice and Sambar or Rice and Dal. 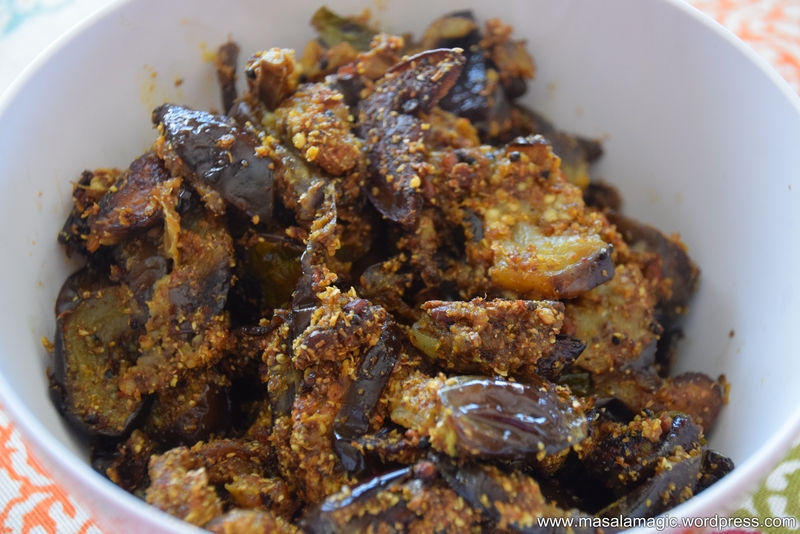 It tastes great even as a side to rice and curd or just plain curd!! Very nice recipe I have not eaten this before ! 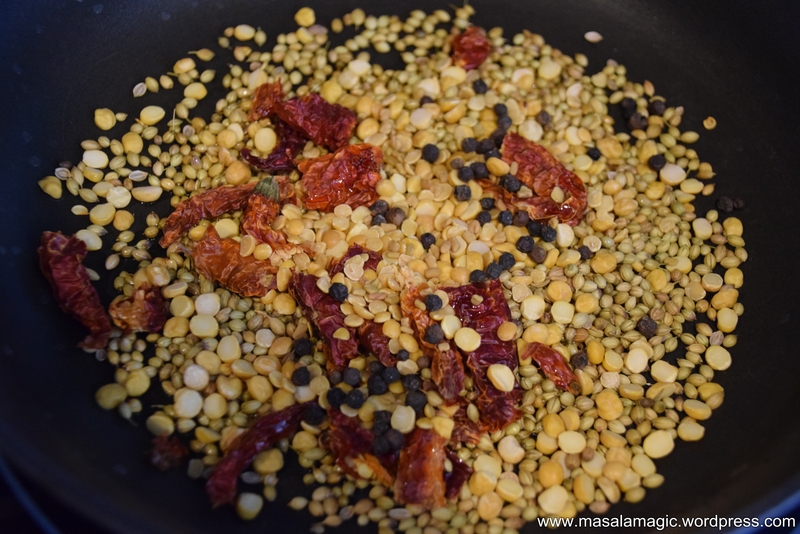 The roasted dal and spice combination is making me drool ! Plates of Masala Dosa – the ever famous South Indian breakfast delicacy – ready to be served!! A half eaten plate of Vada and Kadubu Idli – idli made in a cylinder shaped leaf container, served on a traditional banana leaf – prominent in South India, the banana leaf lends the dish an authentic taste that is best experienced! !